Dennis' winning entry included maximum-points players Todd Gurley, Philip Lindsay, Antonio Brown, Jared Cook and Kaimi Fairbairn. 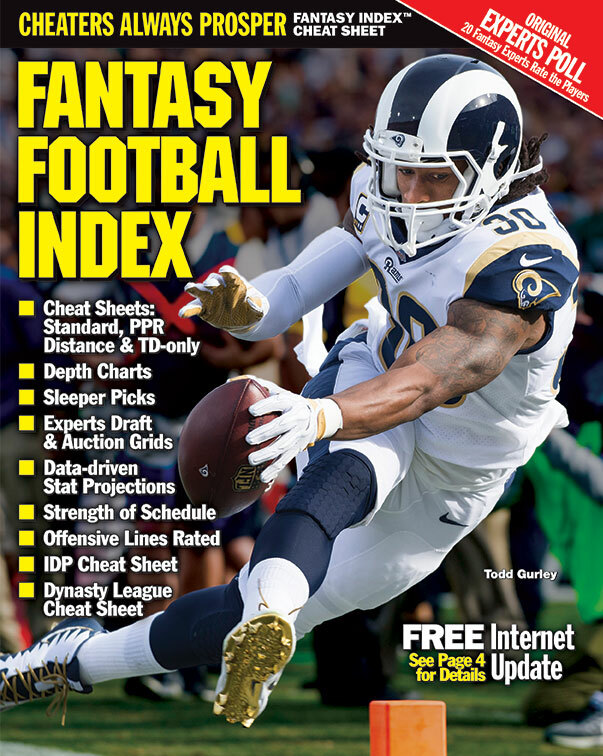 We are recognizing Dennis' superiority with a $25 Fantasy Index gift certificate. Click through to see his winning lineup, the perfect score for this week, the percentage-of-use chart and the overall season-long standings. And learn why Fantasy Index publisher Ian Allan lives in fear of Dennis. In the season-long points chase, David Wilde -- SHADOWDAD -- of Mukwonago, Wisc. is pulling away from the field.. He leads the field by 58.2 points with only four weeks left to go. Fantasy Index publisher Ian Allan experiences a moment of dread each time he posts the daily trivia question. That's because several times each year, Fantasy Index super reader / de facto fact-checker Dennis Lyons discovers exceptions, glitches and oversights in the trivia answers. He's a remarkable fact-checker. And now Dennis can add to his resume Fantasy Index Blackout King For A Week. Enter now for Week 14! Dennis Lyons, Elk Grove, Calif.
1. 1. 2454.6 SHADOW DAD David Wilde Mukwonago, Wisc. 3. 9. 2382.4 Warriors Sam Wood Northborough, Mass. 5. 5. 2381.4 Steve R. Steve Robertson Phoenix, Ore.
6. 4. 2380.5 BUCXPRESS Robert Buckmann Mount Dora, Fla.
7. 10. 2376.2 David G. David Garibalidi Huntington Beach, Calif.
8. 13. 2374.0 Friar Tuck Mike Tucker Baton Rouge, La. 9. 8. 2368.4 GOP Greg Green Lynnwood, Wash.
10. 15. 2359.0 JK Too John Kunka Orland Park, Ill.
12. 6. 2357.6 Rich Z. Rich Zenor Schaumburg, Ill.
15. 11. 2354.7 spencedog Jeffrey Spencer Clearwater, Fla.
17. 23. 2344.3 Baitfish Phil Scarcella Palm Coast, Fla.
18. 19. 2339.2 Douches Jack Silverman Mendota Heights, Minn.
20. 28. 2336.4 Frank S. Frank Sui New York, N.Y.
21. 20. 2335.8 TROY S. Troy Sperbeck Arden Hills, Minn.
22. 27. 2335.6 Mshea11 Mitchell Shea Weston, Fla.
23. 17. 2335.6 Whoops Eiferted Frank Read Cranberry Twp, Pa.
24. 12. 2328.8 UserME59 Norm Costin Cohasset, Mass. 25. - 2327.4 Renegades Mark Christie Fairport, N.Y.
We're still trying to figure out how many players to black out each week. Generally speaking, we try to remove players who would appear on the vast majority of entries. We didn't black out any running backs in Week 13, and 56 percent of you used Todd Gurley. But that's not too back -- heck, a week ago we blacked out a bunch of tight ends and 68 percent of entries included George Kittle, so maybe we get better diversity when we black out fewer players.